It's 50 years since Gordon E Moore, co-founder of the Intel Corporation, made the observation that became known as Moore's Law. In 1965 Electronics magazine had asked him to write an article predicting what would happen in the semiconductor component industry in the subsequent 10 years. Moore was, at that time, director of R&D at Fairchild Semiconductor, and this made him something of an expert in the field. Moore looked at the elements – transistors, resistors, capacitors, and diodes – being used in chips at the time (approximately 60), and based on their use in the preceding years, came to the conclusion that the industry would double these elements every year for 10 years until they hit 60,000 per chip. Ten years later and Moore's prediction proved very accurate, leading a colleague to coin the term 'Moore's Law', but at this time Moore revised his prediction to a doubling every two years. Ultimately transistors came to be the dominant element in chips, becoming the most useful measure of an integrated circuit's complexity. But Moore's Law wasn't just about the quantity of elements and a chip's resulting performance – Moore was also concerned with economics. His original prediction was based upon the number of elements within each chip where cost per component was at a minimum. Interestingly, in the past ten years, increases in transistor numbers have come to be more about cost than performance, with transistors being made smaller in order to keep costs down – although this further miniaturisation has resulted in performance gains in any case. Moore's Law economics in action! Although Moore's first and second predictions were, initially, a means of chronicling the industry's progress, over time Moore's Law became something of a driving force, encouraging semiconductor manufacturers to keep pace with the Law. Today, there are billions of transistors on chips, and this magnitude has a great deal to do with the existence of Moore's Law. 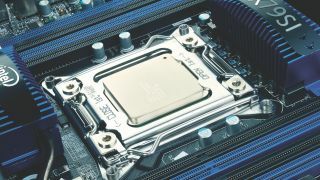 It is said that the semiconductor industry still uses it to guide its planning and to set targets for R&D. This being the case, Moore's Law's impact on our lives and the progress of business and industry cannot be overstated. The way we communicate has changed irrevocably over the past few decades. If Moore's Law hadn't been adopted by the semiconductor industry as a call to arms, would we be working on our own individual computers, making business calls on smartphones or travelling to meetings in today's computer-controlled cars (if we bother to travel at all – videoconferencing has never been more sophisticated)? Unlikely. And there'd almost certainly be no internet without Moore's Law. Gordon Moore has helped to determine our technological reality and is arguably even more (no pun intended) influential in indirectly shaping our futures than Arthur C Clarke – and that's some achievement. So, what helped Moore's Law to gather momentum in the early years following the 1965 publication of Electronics magazine? Of course, the invention of the integrated circuit, which instigated and influenced Moore's article has a huge part to play – without it there would be no Moore's Law, I'd be typing this piece on a typewriter and TechRadar Pro would be a print magazine. We have Jack Kirby at Texas Instruments and Robert Noyce at Fairchild Semiconductor to thank for the 'birth' of Moore's Law and for keeping it alive ever since. But there were other contributions to the Law's early development.